I'm a sucker for a great set of stats. 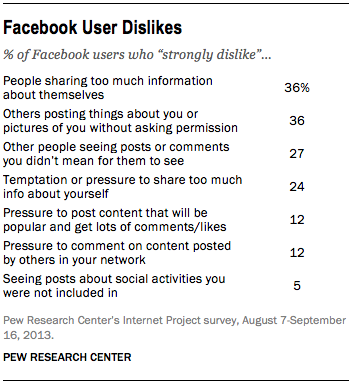 And this new study from the Pew Research Center has some surprising new stats on Facebook. And droves of teens are NOT abandoning the social network -- as some claim. I packed the marketing stuff up top, but stick around because I saved the strangest new Facebook fact for the end. Nearly half of all Facebook users (47%) said having access to photos & videos from family & friends was one of the top reasons they use the social network. But men & women use Facebook differently. Women are more likely to say that viewing photos is the major reasons they use Facebook. 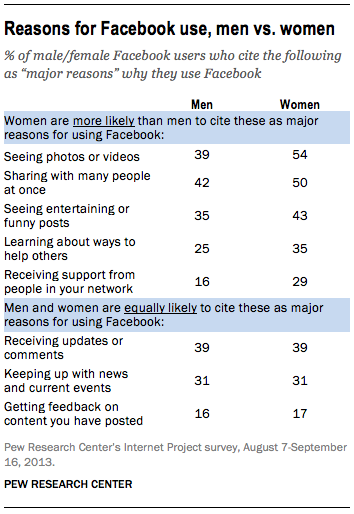 They're also more likely than men to say they use Facebook to find funny content. Keep these statistics in mind when trying to get your fans to interact with your page. 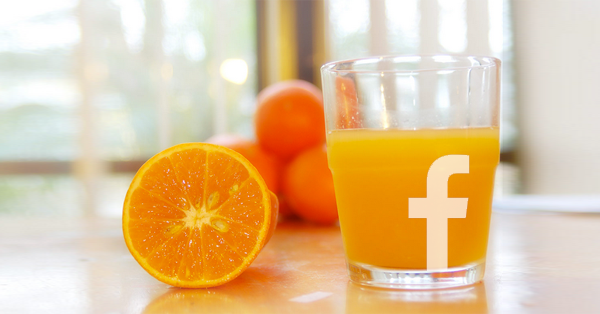 As a page owner running a Facebook page for your business, you should also know that about half of all adults on Facebook have more than 200 friends. That's a lot of potential customers you could reach if your fans share your posts with their networks. 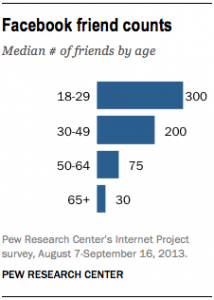 It's not surprising that younger Facebook users have more friends than older adults. Of users between the ages of 18 & 29, 27% have more than 500 friends in their network. Compare that to users who are 65 & older -- 72% of whom have fewer than 100 friends. Most Facebook users said Liking & commenting on other people's status updates & photos are the activities they engage in most. 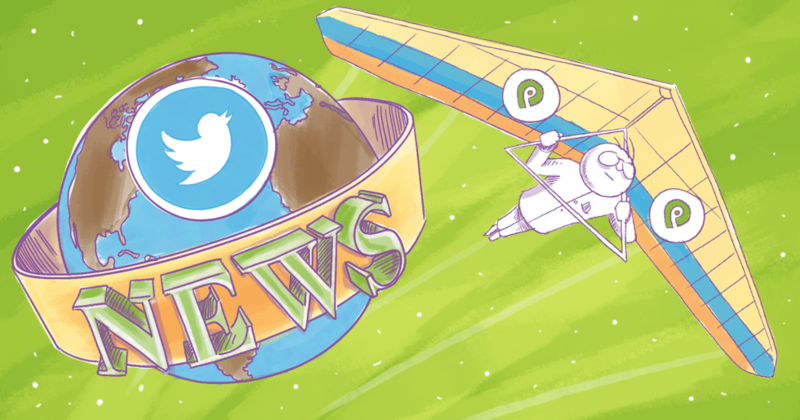 Fan engagement is critical to getting your posts seen by more people, so you should post great content that stands out from other photos & status updates in the news feed. According to the Pew Research Center, of the internet users who don't use Facebook, 52% live with someone who does. In many instances, these may be parents who do not use Facebook but live with a child who does. Fully 66 percent of parents with a child living at home who do not use Facebook themselves say that someone in their household has a Facebook account. Of those not using Facebook who live with somebody who does, 24% view posts on someone else's account. 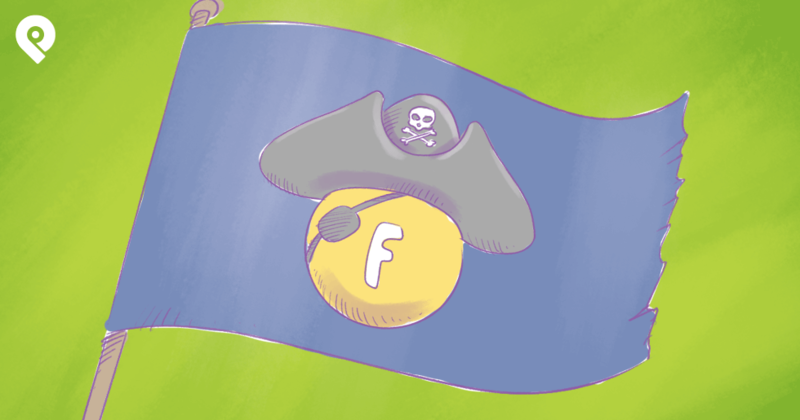 This was the #1 complaint about Facebook in 2013! Tied for the top spot was other people posting updates about you or photos of you without your permission. This last Facebook fact is perhaps the most unusual -- or maybe that's because I've never been asked to "unfriend" somebody. But lots of people have! Among Facebook users ages 18 to 29, 19% have been asked to unfriend someone in their network. No word from Pew on how many people granted the requests. 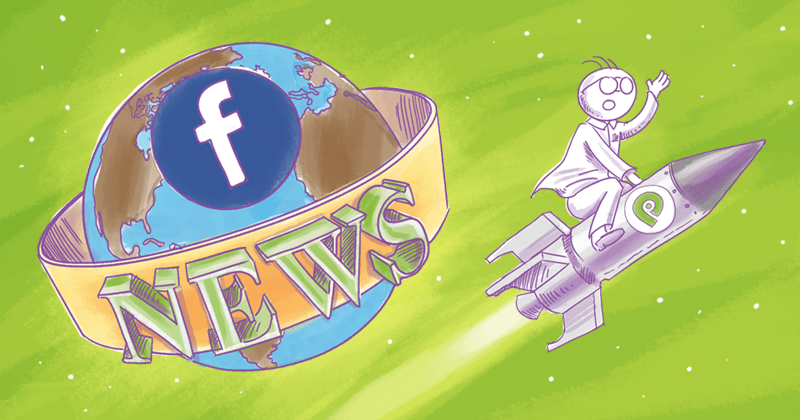 Some of these statistics might help strengthen your Facebook content strategy. But you'll need to talk to your Facebook fans to know how. Interacting with your fans helps you build relationships with your community & better understand what content provides them the most value. Still, there is no substitute for testing different posts. If your fans are mostly women -- who seem to love photos of your products & customers -- by all means post more of those. This report showed that both sexes seek out memes & other funny content online. So maybe a humorous post would be a hit with your followers. Remember -- you don't have to reach a billion users to successfully market your business on Facebook. You only need to reach a few of those who are interested in your company & want to hear more from you -- and then convince them to tell their friends! Keeping a content calendar & using a tool like Post Planner to find & schedule your posts will help you organize your efforts to test different material with different audiences at different times. Which "new Facebook facts" most surprised you? 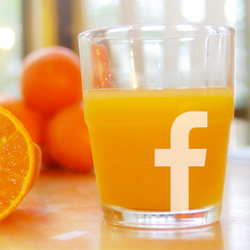 Was there a takeaway you discovered that might help improve your Facebook marketing strategy? Clue me in by leaving a comment below.